Anissa, interior stylist and curator of the blog, House Seven Design, had a keen eye for design when it came to her and her client's kitchens, living areas, bedrooms and bathrooms - but when it came to the styling of her own closet, it had become a place she wasn't too proud to call her own. 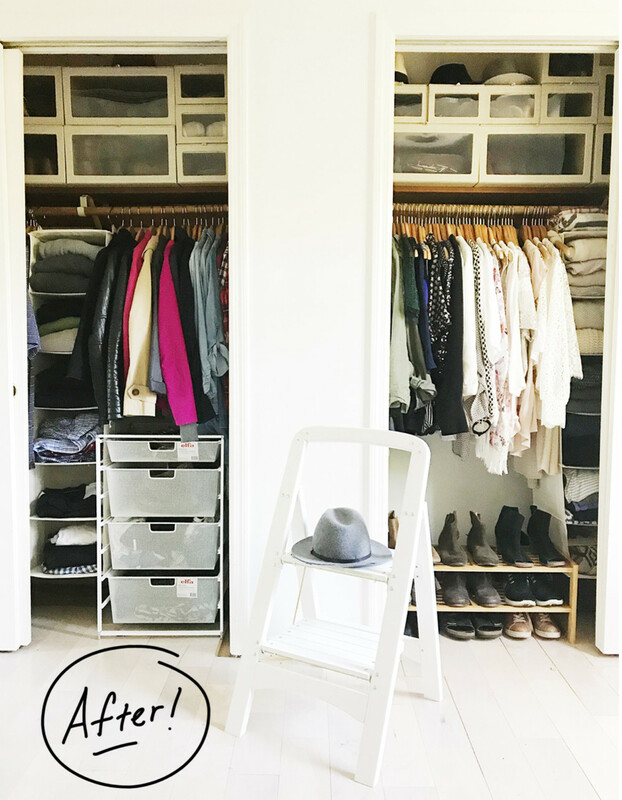 With the help of The Container Store and our #turnyourclosetaround series, we helped set Anissa up with the tools she needed to revamp her closet and make her stylish ways shine. 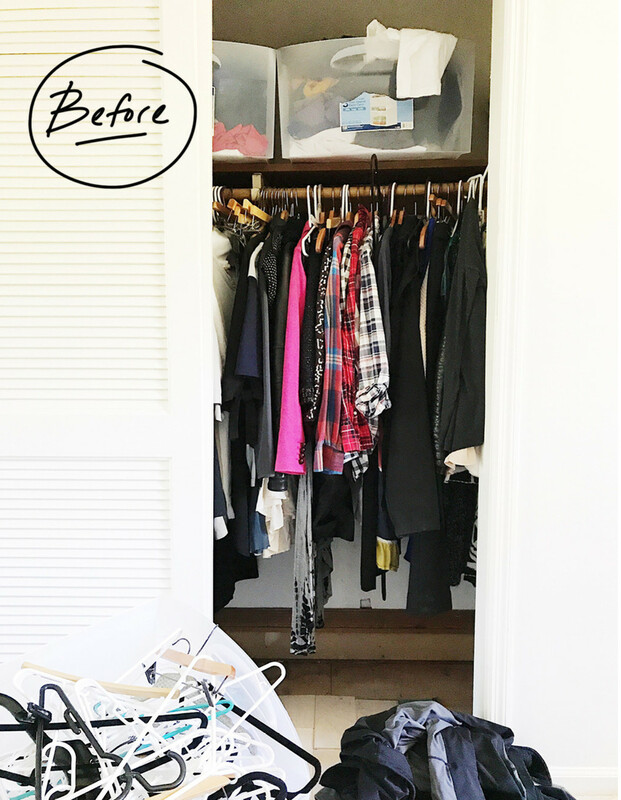 Check out the transformation and all the closet essentials she used, below! Before, there was no system of storage for Anissa to separate her dresses from her pants, or her shoes from her skirts. Items were thrown on the floor and shoved in a corner simply to be able to shut the doors. 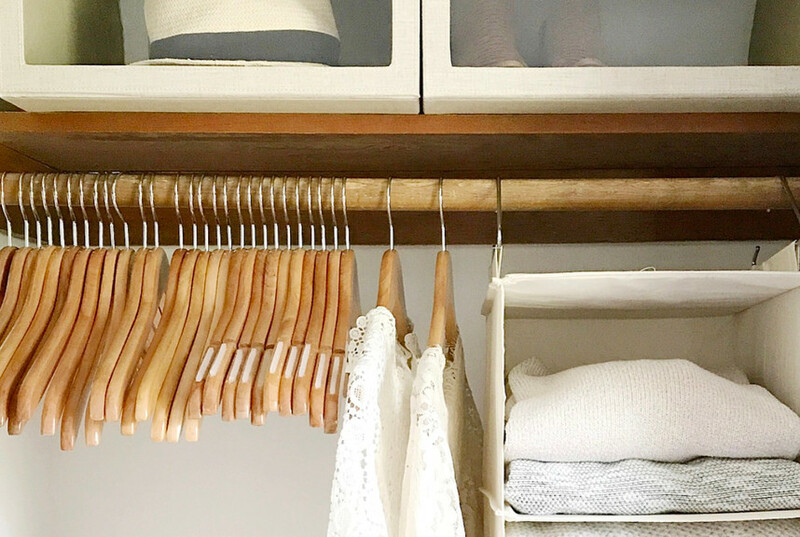 The closets were tiny and there was no getting around that, but with the help of a few of our closet essentials, the tiny space was about to be transformed. Anissa started out the transformation by clearing everything from her closet to take stock of what she did and didn't need, what could be thrown away and what could be donated. From there, she went shopping! Anissa truly made the most of her hanging and higher shelving space with a few simple tweaks to her storage system. Our Drop-Front Sweater Boxes and Shoe Boxes are immediately noticeable in the space. They maximized Anissa's vertical shelving space that, before, was functioning more as permanent and unorganized storage. Now, each Box and Bin serves a purpose, and when Anissa needs to grab something from them, she can simply open the front and access instead of un-stacking and re-stacking. One of our favorite products, our 6-Compartment Canvas Hanging Sweater Organizer, now takes advantage of the ample hanging space that Anissa has within the design of the space. Instead of more boxes and bins, she has open and easy access to any sweaters, t-shirts and tops that she uses more frequently. Basic Shirt, Blouse and Skirt Hangers in the classic natural finish add a touch of style to the space that we know Anissa appreciates. Not only do they look great, but they're designed with notches to keep her more delicate clothing from slipping. Our 2-Tier Stackable Shoe Shelves allow Anissa to organize all of her and her husband's shoe collection in one easy-to-use place. By utilizing just a few more inches of their lower vertical space, they've created a more open feeling to the closet. Our fabulous Mesh elfa Start-A-Stack features three 2-Runner Mesh Drawers, one 1-Runner Mesh Drawer and Back Stop Pins for ample storage of anything from clothing to craft supplies. The fine weave of the mesh prevents small items from falling through, and you can stack them on top of one another if your vertical space allows! The finishing touch within the space? Our 2-Step Wooden Stool in white. Not only does it function to help Anissa and her husband access the higher-up storage, but it can also serve to stage outfits for the next day. Thanks, Anissa, for showing us your fabulous transformation! And don't forget to shop all of these closet essentials that can transform your closets, during our SALE going on now!